Lake Issyk-Kul is surrounded by mountain ranges famous for their picturesque landscapes. One of these sanctuary areas is the Ak-Suu gorge. 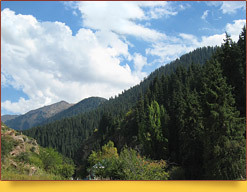 Nine kilometers from the town of Karakol the village Teploklyuchenka is located. Three kilometers above it, there is a reserve of the same name, where begins the Ak-Suu gorge. Along the gorge’s floor 30-40 meters wide, the Ak-Suu River flows. Gray and reddish granites cover the bottom: the rapid river flow beats into white foam, hence the name of the river “Ak-Suu” - “White River”. The gorge’s hillsides reach 300 m height. “Aksu” resort is located a few kilometers from the reserve, housing a sanatorium and about 30 thermal radon sources. It treats diseases of the central nervous system, in particular, ICP - cerebral palsy. After the resort, the gorge widens, and famous giantic Tien-Shan firs appear on the slopes in its lower part. Further, you meet two stunningly beautiful waterfalls 25 and 30 m high. Slender spruce trees grow on waterfalls’ both sides, complementing the fascinating picture of falling water with lively green colors. There is also a moraine-glacial lake Kashka-Suu with clean melt water. One of the most famous sights of the gorge is the huge trapezoid Aksu wall covered with ice and reaching the highest point of 5022 m. The unique creation of nature is the Buurkan-Tash rock, resembling a reddish granite sphinx. The Ak-Suu gorge ends at the foot of the Karakol peak, which is 5271 m high and is the highest point of this region. It is not surprising that the Ak-Suu gorge is one of the most popular places for mountain hiking adventures.